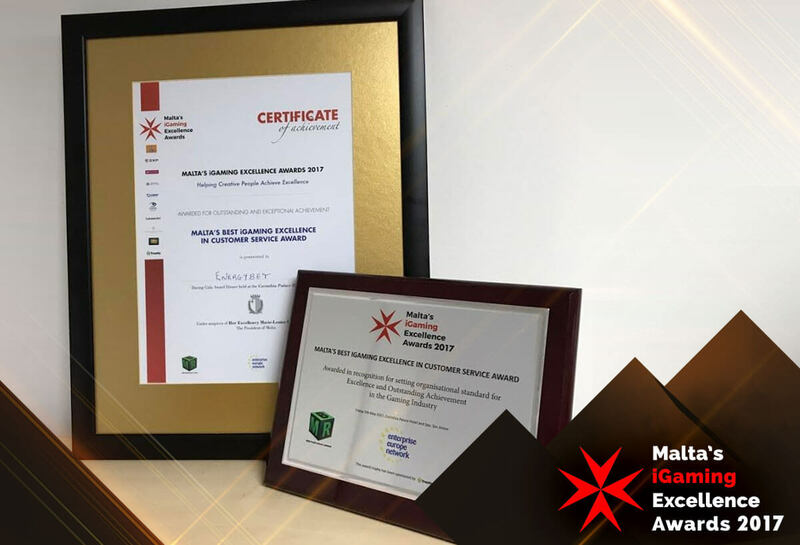 On the 5th May, EnergyBet received the Excellence in Customer Service award at the inaugural Malta’s iGaming Excellence Awards, held at the Corinthia Palace, San Anton. The glamorous event saw the very best of Malta’s burgeoning iGaming industry come together to recognize the achievements made over the last exciting year. For EnergyBet it was a fantastic milestone, coming just months after winning the SBC Rising Star in Sports Betting award in London. It further underlines the incredible progress towards delivery a world-beating service made at EnergyBet – a sportsbook that still hasn’t reached its first birthday! At EnergyBet we know that our product is of paramount importance, but we also believe that customers deserve the very best service and support. To be recognised by our local industry peers, who set a very high standard, really emphasises just how well regarded the EnergyBet customer service team is, and should give potential new customers a great deal of confidence when choosing to use our service. All that remains to be said is another huge “congratulations and well done” to the entire EnergyBet customer service team, and a big “thank you” to all of our customers and those who helped make the award possible.